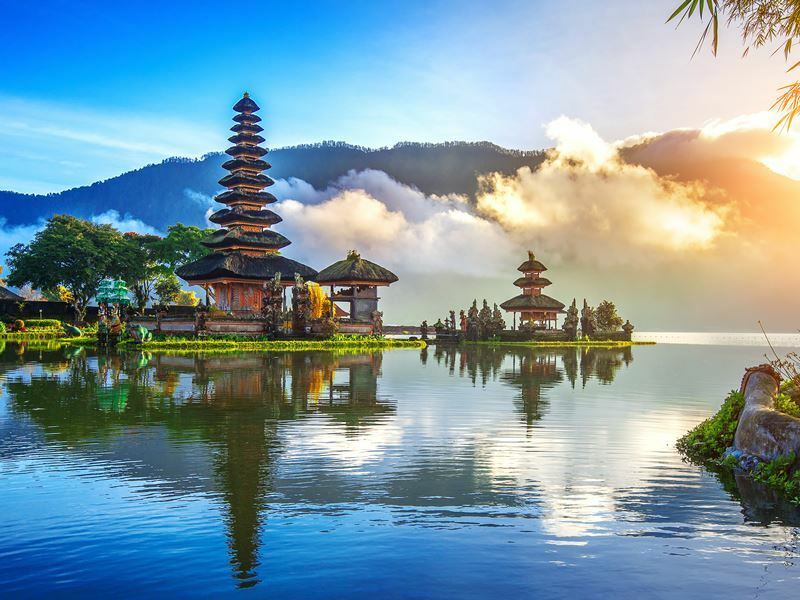 As Indonesia’s superstar, the volcanic island of Bali (nicknamed Land of the Gods) seduces photographers with a dramatic landscape dotted with serene temples, emerald-green rice terraces, stunning beaches, rugged mountains, expansive forests, and spectacular historical and religious architecture. We seek out the picturesque highlights in what is one of the most spiritually enlightening places on the planet. 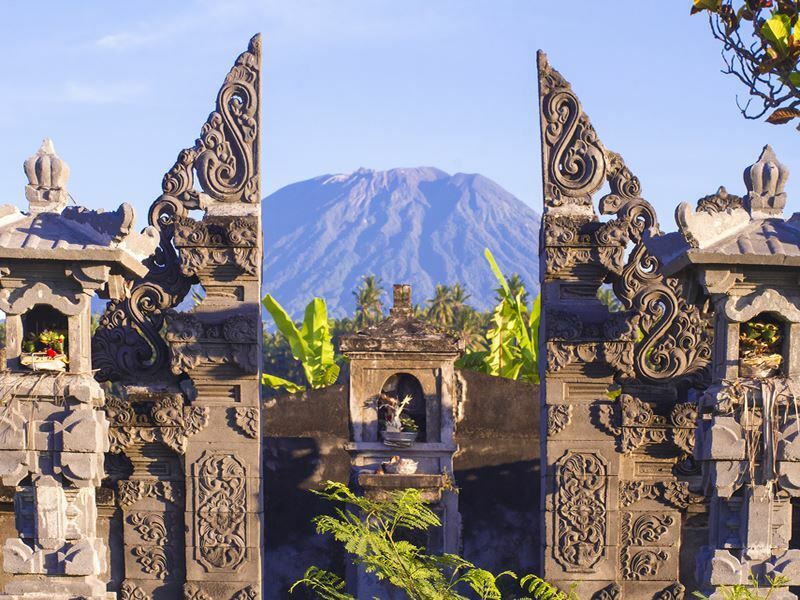 Of all the photogenic mountains and active volcanoes in Bali, the 3,031-metre-high Mount Agung gets the glory for being the highest and the holiest (legend states it was created by the Hindu God Pashupati when he split the Mount Meru - the presumed spiritual axis of the universe). Scaling this huge icon takes a good part of a day on two unique treks: the popular trail from Pasar Agung or the far more challenging route starting from Pura Besakih. Whichever route you pick, you’ll be rewarded with amazing 360-degree island views so long as this so-called “pulsating beast” is not causing mass devastation (it last erupted on 13 February 2018 after being in a state of “rest” for several weeks). Equally worth a climb is Mount Batur for its incredible sunrise vistas, Mount Batukaru for its rainforest scenery, and Mount Lempuyang for its collection of seven spiritually significant temples scattered along the hiking path to the summit. Get the shot: While Ubud and Pura Lempuyang are both excellent locations for powerful images of the mighty Mount Agung, the under-the-radar valley of Sidemen is one of the most idyllic spots for landscape photographers. Aim to visit here when the sun is out in order to capture the lush green terraced hills that are overshadowed by Bali’s most revered - and volatile - peak. 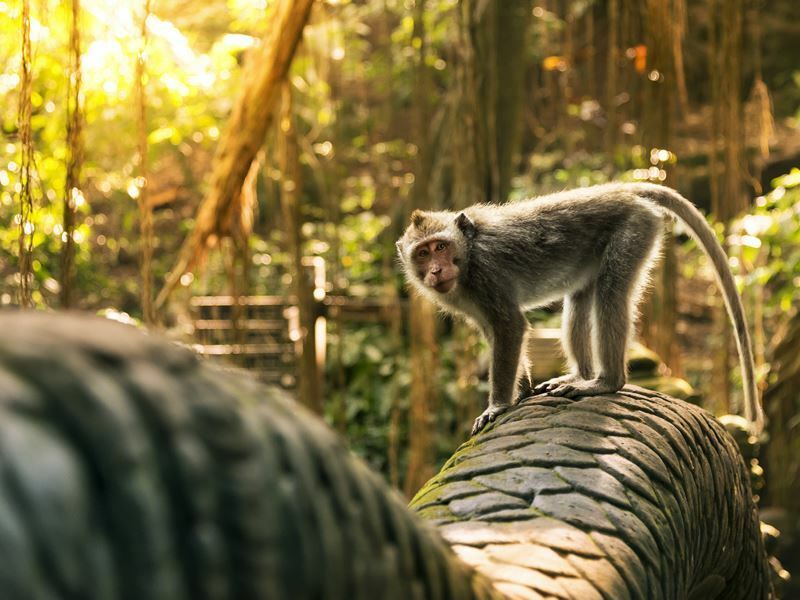 For click-happy travellers venturing into Bali’s gorgeous forested interior, the 27-acre Ubud Monkey Forest (officially known as Mandala Wisata Wanara Wana) rewards with swathes of lush jungle filled with 600-plus resident grey long-tailed Balinese macaques - all of whom are remarkably tame and more than happy to pose for selfies. Less touristy but also worth a visit is the 73-square-mile Bali Barat National Park for its 160 different species of prolific wildlife such as the leopard cat, rusa deer, wild boar, large flying foxes, and huge array of birdlife including hornbills, kingfishers, swallows, coastal brown boobies, and the rare Bali starlings (also known as Rothschild’s Myna). The best of the rest include Alas Kedaton Monkey Forest for its hundreds of long-tailed macaques and the Besikalung Wildlife Sanctuary for its large variety of protected animals and birds who are under threat from poachers and illegal wildlife traders. Get the shot: Ubud Monkey Forest opens at 6am, so early risers can make the most of the interesting morning light scenes before the crowds arrive. Sightings of long-tailed Balinese macaques are guaranteed everywhere, and as tempted as you will be to lure the monkeys for a close-up, do not feed them anything (especially bananas) as you’re very likely to be bitten. 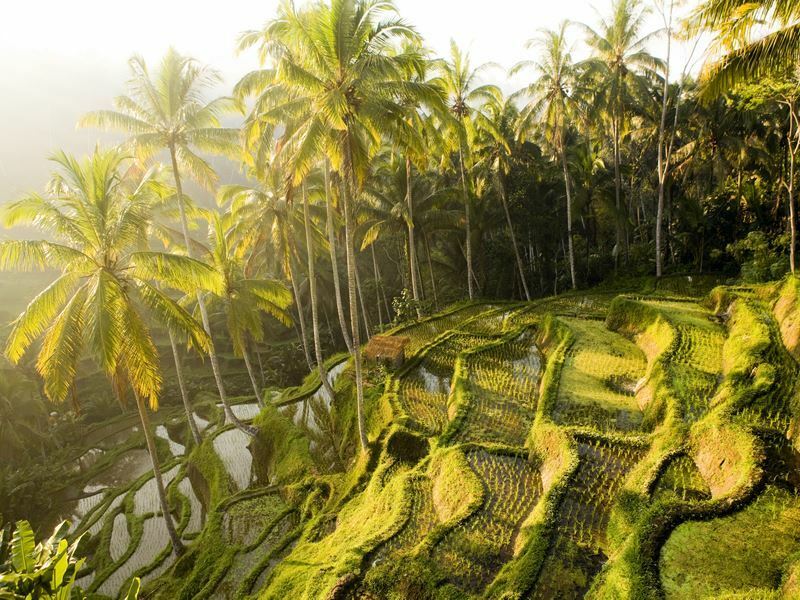 For a true insight into the island’s heritage, there’s little in Bali more awe-inspiring than its much-photographed rice paddies; think ribbon-like stepped terraces in vibrant colours that look more like abstract paintings than real-life landscapes. But not all of these hand-carved wonders are created equal, so if you only have time to squeeze in a few make your first stop the astonishingly beautiful Tegalalang Rice Terrace, just north of Ubud. Here you’ll find a vivid green expanse that’s best photographed in the early morning or late afternoon (midday is generally too hot). Equally stunning is Belimbing Village for its rolling plantations (coffee, clove, rambutan and mangosteen is also grown here), Pupuan Village for its uniting seams that both connect and separate each rice paddy, Tirta Gangga for its crop-dotted hillsides, and the UNESCO-listed Jatiluwih for its fields that follow the flowing hillside topography of the Batukaru mountain range. Get the shot: You’re allowed to hike over the intricately-designed Tegalalang Rice Terrace and take as many pictures as you want. There is no entrance cost, but you may be asked by local farmers for a small donation for the upkeep of the trails and bridges or a small “thank you” fee for letting you feature them in one of your photographs (whether it was intentional or not). 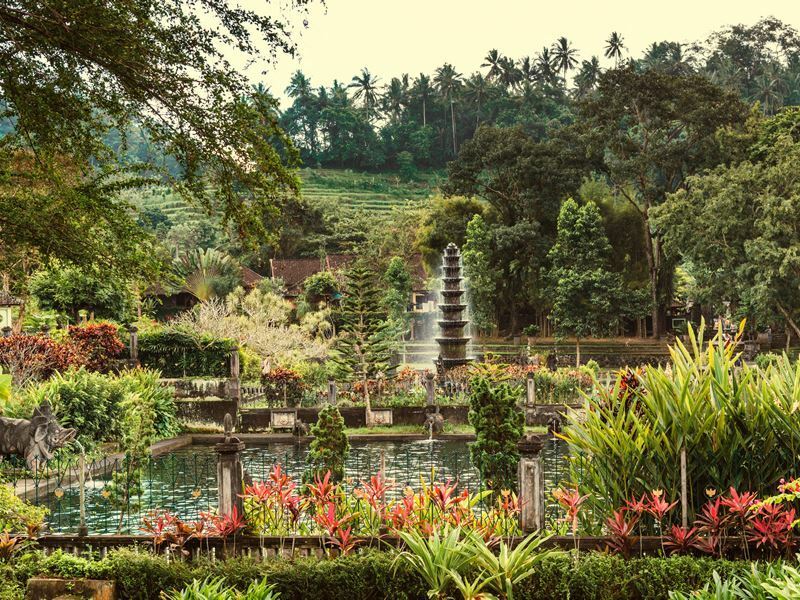 Those wanting to capture the ephemeral beauty of the island’s gardens should head to the 389-acre Bali Botanic Gardens - the horticultural wonderland located in the mountainous region of Bedugul, around 90 minutes north of Denpasar. Established in 1959, it features a number of facilities that support plant research and conservation, including a herbarium, seed bank, library, glasshouses, nurseries, and bamboo garden. Highlights include 100 species of begonias, 300 species of orchid, and the giant rafflesia that has bloomed and wilted here several times throughout the years. Also visit-worthy is the Tirta Gangga Royal Water Garden in the regency of Karangasem for its labyrinth of immaculately designed statues, sculptures, bridges, pools, ponds, polygonal stepping stones, and flower-filled tropical gardens. There’s also a large pond at the southern side of the complex that’s filled with Koi carp and other large freshwater fish as well as an additional pond with healing waters (the latter is open for public swimming). Get the shot: Make a beeline for the Tirta Gangga Royal Water Garden’s elegant centrepiece - the eleven-tiered Nawa Sanga fountain. The waters here are deemed as sacred and used for religious temple ceremonies (Tirta means blessed water and Gangga is a derivative of Ganges - one of the holiest rivers in Hinduism that attracts millions of pilgrims to its shores). 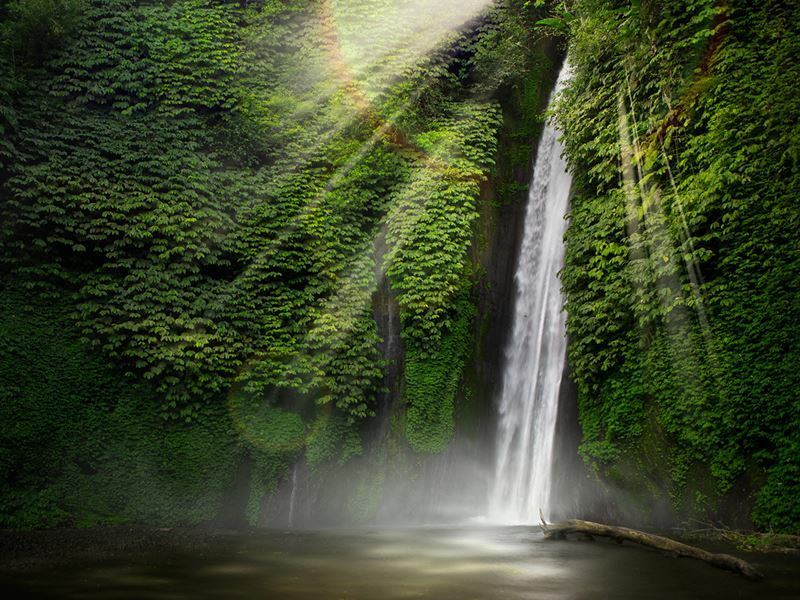 So long as you’re armed with a waterproof camera and a tripod, nothings beats splashing around in Bali’s waterfalls for creative and abstract compositions. While it’s impossible to see all these beauties in one visit, must-dos include GitGit Waterfall for its 40-metre-tall cascade that pours into a rocky pool, Sekumpul Waterfall for its cluster of dizzyingly high narrow cascades in a lush bamboo forest setting, and Banyumala Twin Waterfall for its double-whammy of water that trickles down a wall of steep rocks. More scenic still are Munduk and Melanting, both of which are located approximately 850-metres above sea level in Bali’s lush and forested central-northern highland region. Close enough to each other to do in a day, both tempt with drop-dead-gorgeous natural backdrops, crashing waters, occasional wildlife and bird sightings, and crystal-clear pools located at the base where you can take a refreshing dip. Get the shot: For thrillseekers, the high-altitude NungNung Waterfall at 900-metres above sea level seduces with thousands of litres of water crashing into a pool below (chances are you will hear it before you see it). Equally dramatic is Aling-Aling Waterfall where it’s hard to resist putting down your camera to ride down the natural water slide and cool off in the shower-like sprays. Bali’s wealth of shoreline means there’s no shortage of chilled-out places where you can swim in luminous waters and laze on sun-kissed sands (due to the island’s geology you’ll also find many will be black, white, silver, or deep grey). Some of the most breathtaking of the lot include Yeh Gangga Beach for its dark sands that stretch for miles in both directions, Kuta Beach for its fabulous surf conditions and sunsets, Crystal Bay for its picture-perfect backdrop and clear aquamarine waters, and Padang Padang Beach for its surfer-approved waves (this featured in the 2010 movie, Eat Pray Love). 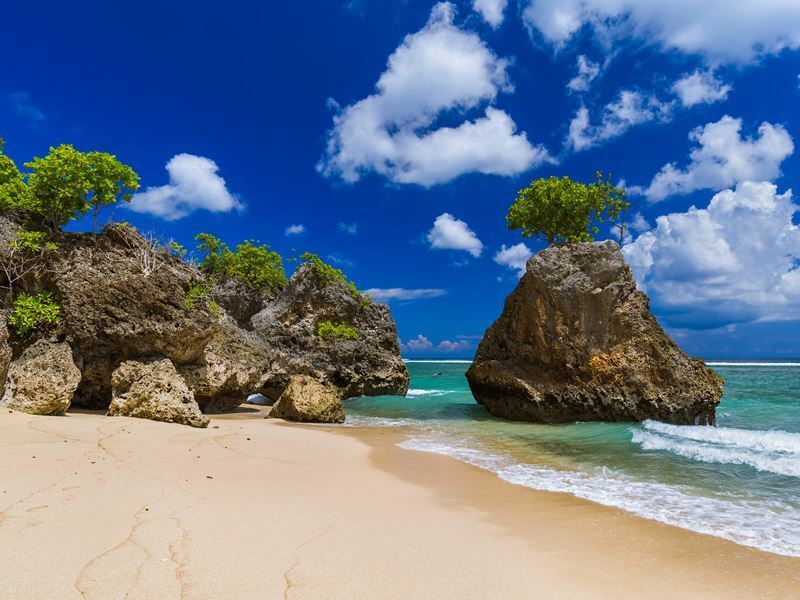 Further sandy gems include Nusa Dua for ribbons of pale gold sand, Sanur Beach for amazing seashell-hunting, and Lovina Beach for diving, snorkelling, and dolphin-watching tours. Another great spot is Echo Beach for its shimmering white sands and waters that cater to all types of surfers, from newbies to professional. Get the shot: As one of Bali’s most popular hidden gems, Bingin Beach offers the best of all worlds: brilliant-blue Indian Ocean waters and white sands for sun-worshippers, roaring breakers for surfers, and exotic sunsets for photographers. The whole place has a bohemian-chic vibe complete with rustic food shacks and cool-looking signboards fashioned from vintage surfboards. Bali’s kaleidoscopic sunsets are world-famous and especially dramatic during the so-called “blue hour” just after the sun sinks over the horizon and the sky turns from a vivid crimson to purple, cobalt blue, and finally to black. Once you’ve played around with your camera’s exposure compensation (the feature that makes pictures lighter or darker) and adjusted your ISO to its lowest setting, head to any of the beaches along the western coastline - or visit one of the island’s iconic temples to add an interesting silhouette to your composition. Some of the best places for unobstructed sunset panoramas bathed in a golden haze include Uluwatu Temple for its vast sky and ocean backdrop, Puru Ulun Danu Beratan for its picturesque mountain setting, and Lembongan Island for its sensational outline of Mount Agung. Another not-to-be-missed spot is the stylish Rock Bar on Jimbaran's coast for its unparalleled views across the Indian Ocean. 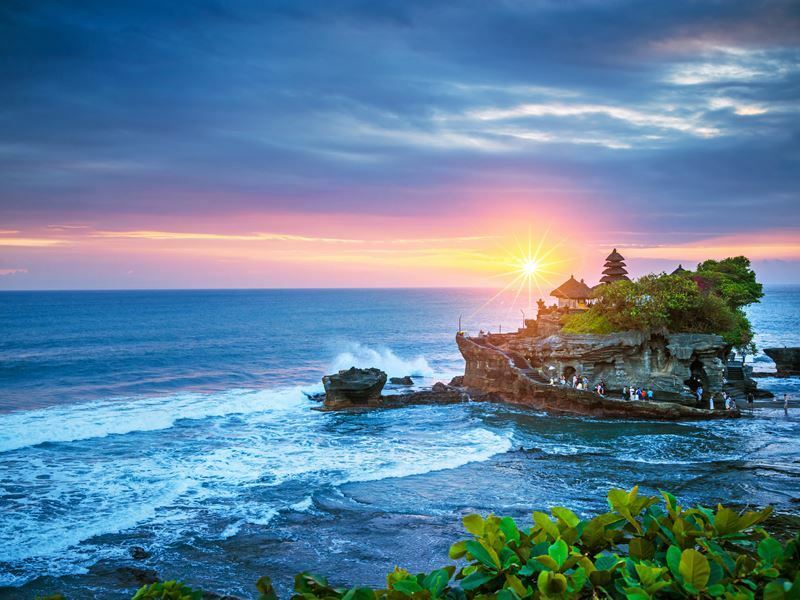 Get the shot: Probably the best sunset spot in the whole of Bali is Pura Tanah Lot - the ancient Hindu shrine complex perched on top of a rocky outcrop (legend states that it’s protected by holy sea snakes formed from the scarves of its founder). It gets extremely crowded here, so try heading to the far south-east of the rocky shorelines for a less touristy experience. Given that the coral reefs fringing Bali’s coastline are some of the world’s most biodiverse, there’s plenty of marine life to grab your attention. For non-divers, the best option is to book a half-day fishing cruise where reeling in a prize mahi-mahi, wahoo, tuna, trevally, barracuda, or even an Indo-Pacific blue marlin are all within the realms of possibility. However, if you’re up for an underwater challenge, head to the fish-rich waters of Amed and Padangbai - or seek out barracuda, Spanish mackerel, mahi-mahi, sailfish, travelly, and tuna in the waters surrounding Nusa Penida, just off Bali’s mainland. Equally rewarding are the tiny Gili Islands that are easily by public ferries or private charters from Padang Bai or Amed. 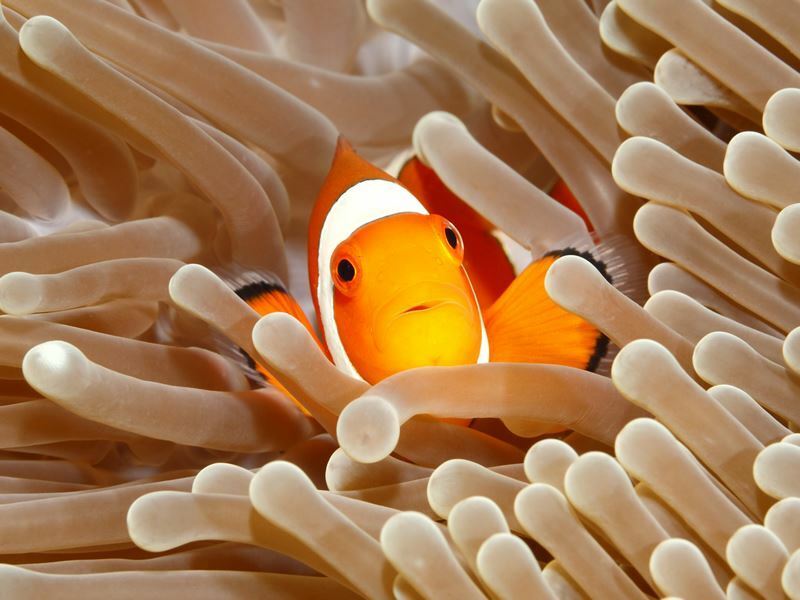 Here you’ll find two types of turtles (hawksbill and green sea), over 50 species of sea snake, and plenty of porcupine fish, ornate ghost pipefish, reef sharks, manta rays, and false clown fish (otherwise known as Nemo). Get the shot: For a one-of-a-kind underwater photo opportunity, dive the world-famous USAT Liberty shipwreck at Tulamben - the remote village on Bali’s east. The 120-metre-long cargo steamship that was sunk by a Japanese torpedo in 1942 is now home to an estimated 400 different species of fish, including sweet lips, thorny oysters, and a resident school of jackfish. Bali has a huge amount of unfailingly luxurious hotels and resorts where the natural topography takes centre stage; think serene spas at the edge of the Indian Ocean, private villas nestled in green forests, infinity pools overlooking lush river valleys, and fine-dining restaurants offering overblown views of cascading rice paddies and mountain silhouettes. Some of the most dramatic vistas are at the properties in and around the hills of Ubud, including Maya Ubud Resort & Spa perched high above the peaceful Petanu River and The Samaya Ubud set alongside the iconic Ayung River. Elsewhere on the island, try The Laguna Resort & Spa on the exclusive Nusa Dua peninsula for white sugary sands, lagoon swimming pools, tropical fauna, and seductive outdoor living spaces or The Samaya Bali Seminyak for its blissful gardens, splendid sunset spots, and direct access to Seminyak Beach’s famous volcanic black sands. 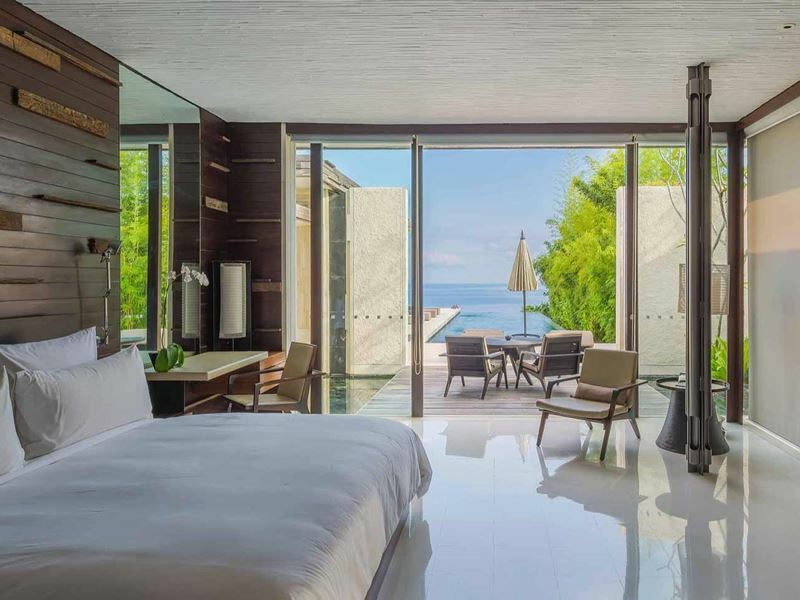 Get the shot: Set on the 100-metre high limestone cliffs of Bali’s Bukit Peninsula, the ultra-contemporary Alila Villas Uluwatu delights photographers with heart-stopping views of the turquoise-blue Indian Ocean any time of day and night. The sunsets here are particularly magical, with the overhanging cabana definitely worth an Instagram shot or two. No trip to Bali would be complete without a visit to at least one of its 20,000 temples (known as pura). The most standout are the sprawling Pura Besakih for 86-plus separate temples, Pura Gunung Kawi for carved shrines honouring 11th centry kings and queens, Pura Tirta Empul for a sacred spring that provides holy water to priests, and Pura Luhur Lempuyang for nine temples that protect the Balinese people from evil spirits. Also worth your time and effort are Pura Taman Ayun for beautiful gardens and thatched multi-roofed shrines, Pura Tanah Lot for spectacular sunsets, and Goa Gajah (also known as Elephant Cave) for a statue of the Hindu god Ganesha and a prayer area devoted to the Hindu god Shiva. Bear in mind that most temples have a small entrance fee as well as a strict dress code (most request that cover your shoulders and ankles so it is a good idea to dress modestly and bring a sarong or scarf with you). Get the shot: Probably the most iconic temple in the whole of Bali, Pura Ulun Danu is located on the western side of Bedugul’s Beratan Lake in. Built in 1633, is it dedicated to Dewi Danu - the river goddess who ensures plentiful water and crops. Most professional photographs manage to give the illusion that it floats on the water, even though there’s a grass walkway on one side.